Nestle’s Butterfinger commercial starts with the sentence “A bull rider is bold” and it proceeds like this: “Now a bull rider on a plane is bolder than bold. And if he jumps from that plane, well, that’s bolder than bolder than bold. And if he jumps eating a Butterfinger bar, in crispety and crunchety and peanut-buttery glory, well, that bolder than bolder than bolder than bold. And if he eats it, even when his mother tells him not to, that’s bolder than bolder than bolder than bolder than bold”. 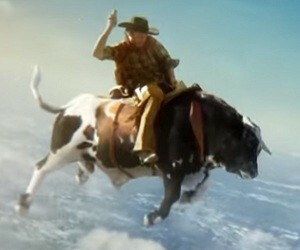 In the 30-second commercial, we can actually see a bull rider jumping from a plane and eating a piece of Butterfinger bar even though his mother, who is floating in the air, warns him that he’s spoiling his dinner. He suddenly disappears into the landscape, when his parachute opens up.